Just leave a bag of non-perishable food by your mail box. 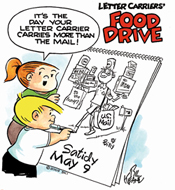 The Letter Carriers will take the food the Mercer Street Food Bank and they will distribute it across Mercer County. Cans of protein such as tuna, beef stew, ham are needed as well as peanut butter, soups, can vegetables and fruits. Find ways to help on our website www.merceralliance.org.